This run begins at the confluence of the Gardiner River and the Yellowstone River. 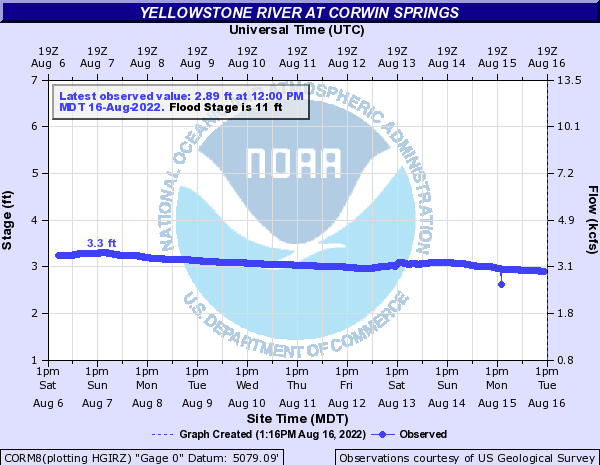 This is just North of the Yellowstone Park boundaries where river running isn't currently allowed. For rafters there are waves, for kayakers there is surfing and for tourists there are commercial companies that will gladly accept money to take you down this stretch. Expect flatwater in places combined with several rapids. This section has a rapid, pool drop feel to it so even if you do go for a swim you should be ok regrouping with your boat. As with any open moving water, take precautions. Always wear a life jacket and use common sense. If you want to skip the last 5 miles of flatwater, then take out at the airport access site. Otherwise enjoy the float past Devils Slide and take out at Joe Brown where Yankee Jim Canyon starts. From the heart of Gardiner, MT follow E. Park Street east to where it ends in a hotel/lodging part of town. Just beyond that is a small dirt area where the Gardiner and Yellowstone rivers meet. This is the typical put in for this run. Parking can be an issue during crowded summer months. It is harder to get rafts down here than it is kayaks. Use your own judgements while putting in and don't do anything illegal. This access point is just north of the Gardiner airport off of Highway 89. You can use this to take out before the flat water section in Paradise valley, or you could put in here for a full family friendly scenic run. This is the take out for the Gardiner Town Run or the put-in for the Yankee Jim Canyon run. This is just off of Highway 89 about 7 to 8 miles north of Gardiner MT.